...Imagine if you could work less and make more money while helping your clients achieve true transformation? ...Imagine if you could effortlessly create a lasting legacy by touching the lives of dozens, or even hundreds of clients with your coaching business? ...Imagine if you could set yourself up with a lucrative freedom-based business + lifestyle that allows you to attract and work with your dream clients from all over the world? Ok, now open your eyes and come back to me. Unfortunately, everything you’ve just imagined is kinda far from your current reality. Uncertainty keeps you stuck and you are not clear on your purpose, those you’re meant to serve, and how you can best serve them. You’re living on hope and surviving by the occasional client who agrees to pay for your “discounted” sessions or hourly programs. Every day it’s you against the clock and in your frantic and hurried energy you feel desperate to sign new clients, make money, and take time out for you. You’re the only coach around who doesn’t know the secret to enjoying consistent 10k, 15k, and 20k months? Making multiple five figure months and beyond as a coach is a huge myth and the coaches who claim to be doing so are BIG. FREAKING. LIARS? The kind of success you crave requires you to get more training/certificates, spend tens of thousands on marketing and promotion, or get lucky and score an introduction to some big influencer? Yes, you’ve been left out on a secret - ﻿but﻿ not for much longer. - they just have a system in place that you’re lacking. That system is called a 'Signature Package Offering',﻿ ﻿and you’re about to create one so that you can take your coaching business to the land of your dreams. You’re struggling in your Coaching Business, selling one time sessions, charging by the hour, and experiencing constant anxiety never knowing where your next client is going to come from. You’ve never had a paying client and don’t know how to define your ideal client, create a premium coaching package, finally charge what you’re worth, and attract clients who will effortlessly pay what you ask to enroll in your group coaching programs. Those other coaches are not special, extraordinary or unique. • You deserve the abundance you desire they have. • You deserve the time and freedom you are longing. And it can all be yours - ﻿starting﻿ now﻿. I’m Carolin Soldo and I created Bring Your Passions to Life for up and coming passion-based coaches like you! Unlike a lot of Online Business and Marketing Coaches - I bring real life business, marketing, and ﻿﻿branding﻿﻿ experience to the table. Why ﻿should﻿ you work with me? I’ve been in the coaching industry for over 6 years and I consistently enjoy $40,000 months and $100,000 launches in my 1:1 and group coaching programs. I’ve got an MBA from a top university. I built and sold a 6-figure online business and enjoyed tremendous success as an online health coach. I’m the creator of the premier business coaching programs for life, health, and business coaches, including Brand Your Passions®, and From Passion to Profits®; and, I worked as a marketing executive in the financial industry for 10 years. I use my real life experience to teach my clients and students how to build rockstar coaching businesses that are successful and sustainable. As a former health coach, I bring a unique perspective when it comes to business-building, brand-identity, and online marketing. I’m here to empower female entrepreneurs like you to take charge of your success by building your businesses and erasing your limiting beliefs so you can live a fulfilling and abundant life. If you see all of my current success and assume that I’ve always been successful - let me let you in on something - you’re dead wrong! Even though I had exceptional traditional business skills, I was totally clueless when it came to online marketing, branding, and sales. I saw other people becoming successful online, but I struggled with how to position my programs and market myself so I got desperate and was willing to try crazy techniques. I’d try a marketing technique or tactic, then hold my breath and hit post, publish, or share with my eyes closed - just hoping that it’d finally stick! And for over a year I just kept feeling small, staying stuck, and committing the eternal online marketing sin… One off packages. I was selling one-off nutrition plans (for $97) with no system for following up, or outline for taking people on a journey that would allow them to achieve a transformation. To put it simply, I was leaving money on the table. And, even worse I was overworked and over-tired because I was building my business on the side while under-charging for all the value I was offering. I spent over a year trying to learn how to build my online business on my own. But, my big breakthrough came when I invested in a mentor who showed me how to create signature package offerings to bring in my first 5k, 10k, and beyond! What Difference Does Having a Signature Coaching Program Make? I have created and filled all the spots in my three signature group coaching programs in the past year. I also stay consistently booked solid in my 1:1 program because I’m able to convey the value of my offerings when I launch my signature package programs. These days I’m able to live freely, experience abundance, and make a lucrative income without overwhelm or stress by launching my signature coaching programs a few times a year. I’m here to show you the exact steps I took to build my business by creating my own signature packages so you too can go from selling one-off $97 dollar offerings to enjoying $100k+ launches using the Bring Your Passions to Life system. was created especially for new and rising female passion-based coaches that want to consistently attract dream clients and bring in a consistent cash- flow. Before you attempt to go out and try your own version of spaghetti-marketing let me save you tons of time, effort, and money by showing you exactly what you’ll get in just 4 weeks with me! (I tallied over $22k in investments before I made a single cent of profit in my business). If you’re ready to start, grow or scale your business, the number one way you can guarantee your success is to create a signature program. I know you’re sick and tired of feeling overwhelmed and confused. Sell out your signature package and make as much money as you desire without going crazy, draining your energy, or working with too many 1:1 clients. If you’re reading this it’s because you have a deep desire to leave a lasting legacy and touch hundreds, if not thousands of people as you grow your online business. By just being here and learning this secret you already have the upper-hand when it comes to growing your business. But, imagine just how big the business will be when you actually leverage and launch your own programs? While other female coaches are gasping for air and fumbling to stay afloat, you’ll be cruising right along with a long-term plan for growing a sustainable online business. that’s available to you 24/7 so that you don’t have to wait on anyone when inspiration hits and you’re ready to build + scale your business from the ground up. You’ll refer back to these materials time and again - consider them the bible for creating signature programs. where I am going to teach you the ins and outs of finding your most profitable niche, getting clear on how you are going to create your client transformations, and how to package, name, and price your Premium Coaching Package. to mastermind with your classmates. to go along with your weekly lessons so that you can take action on what you’re learning and create your irresistible offering with ease. Most online coaches don’t offer a mastermind experience because it’s more lucrative for them to charge upwards of 20k per student for laser focused group coaching. But, I’m not like them. I do business from my heart and I believe that business advice/support should be accessible to everyone who needs it. "I got my first 2 paying coaching clients!" Working with Carolin gave me the plan and structure I needed to build a solid foundation for my business. Carolin helped me get clear on what I needed to do as well as how to prioritize it and it was up to me to make it happen. I redesigned my coaching program for VIP clients, increased my program price by over 300% from $1500 to $5000, learned how to craft marketing messages that speak directly to my potential clients.I would recommend your services to entrepreneurs who are early in their business and who lean towards taking action, embracing technology, and keeping an open mind to learn. When you enroll now you’ll also get this killer bonus! One of my secret weapons for my online business is my insanely talented copy team, who are able to tap into my voice and create persuasive sequences and hooks. That means you won’t make it to 5k-10k months and beyond if you don’t take risks and believe in yourself or your business. **I want to be fully transparent and let you know that spots in this program are limited because I truly care. Unlike some of the big name coaches, I show up every day inside our Facebook group to answer any and all questions and support you in both your successes and your challenges. Wouldn’t you love to scale your business with 1:1 clients so that you can wake up in the morning on your terms, no alarm, and no boss breathing down your neck? Wouldn’t it be awesome to be the envy of all your neighbors who wonder what in the world you do in order to afford this kind of lifestyle? Wouldn’t you be able to breathe easy and really enjoy life if money weren't an issue and clients flowed freely?I know you’re curious to know exactly how each part of Bring Your Passions to Life fits together to position you for profits with your premium coaching brand. Craft your Marketing Message including a Sales Page that will make you unforgettable! Find out how to Hook your Communications for instant results and new clients in your program! Hiring a 1:1 coach to go through this 4-week transformation can be pricey and you’ll only hear one person's perspective on your business. By enrolling in Bring Your Passions to Life you’ll get all the support you need from me and your mastermind sisters while investing at a level that feels good to you. This program grants you an exclusive invitation to get a behind the scenes look at my exact strategies for creating consistent multiple 5-figure and 6-figure launches so that you can replicate my results! Could you create your offers then launch on your own? Maybe. But with this DIY approach you’ll also experience extreme stress, overwhelm, and anxiety. Then you’ll find yourself in exactly the same spot you’re standing in today - the only difference is maybe a year would have gone by! You can access the exact structures and systems I﻿’﻿ve﻿ ﻿used to create my signature packages and grow my online coaching programs with ease, fun, and flow. Creating a signature package that sells is not about just throwing a bunch of stuff together and slapping your name on it. It's about taking your passions, knowledge, and experience and putting them together in a way that conveys your true essence while also providing real value. Want to Know if Bring Your ﻿Passions﻿ to Life is for You? Have a deep desire to finally launch your signature program, and start making a profit, like NOW. Want to learn how to put together a group coaching program that offers just as much value as a 1:1 offering. Would rather continue to sell one-off sessions and vastly undercharging. You ﻿﻿﻿can﻿﻿﻿ ﻿sign﻿﻿ ﻿up ﻿﻿for﻿ ﻿﻿﻿﻿﻿﻿Bring﻿﻿﻿ Your Passions ﻿﻿﻿to﻿﻿﻿ ﻿Life﻿﻿﻿﻿ ﻿﻿﻿today! Spots will fill up quickly and there are limited seats available. Don’t forget about your Bonus! One of my secret weapons for my online business is my insanely talented copy team, who are able to tap into my voice and create ﻿﻿persuasive﻿﻿ sequences and hooks. Your Message deserves to be heard! You are here to make a difference and I know how to help you do it. When you enroll in Bring Your Passions to Life, you’ll be taken to a shopping cart where you can complete your enrollment and pay by credit card. I know what you’re thinking by now… The modules look actionable and the program looks solid. Now you wanna to see the results I can help you achieve first hand, right? Carolin is a heart centered, attentive, and knowledgeable business coach. Carolin helped me narrow my market niche and find my avatar.When you know who you are marketing to everything begins to fall into place. With each step, I find myself closer to creating an amazing online intuitive life coaching business that helps so many women find their authentic selves and steer towards creating amazing relationships. 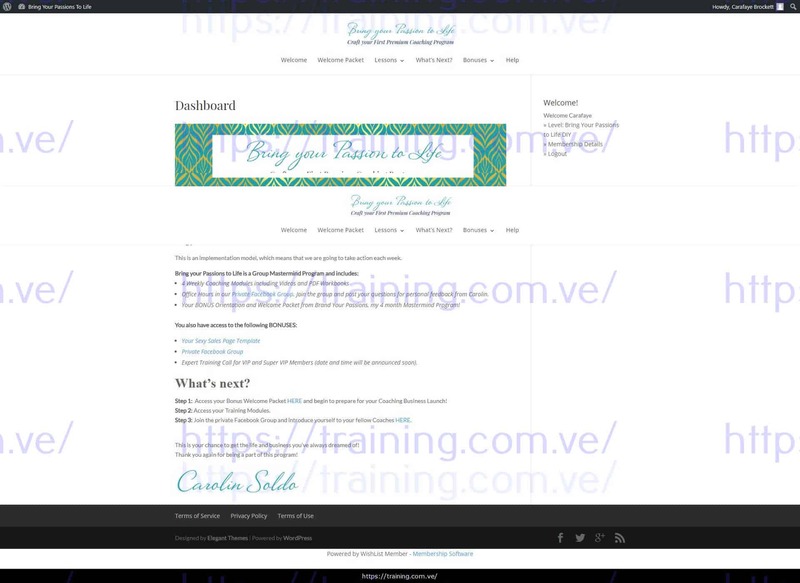 With Carolin's guidance, I am becoming more and more confident as all the technical details become easier. I am also more gentle with myself and allowing myself to learn what I am doing rather than giving up and getting frustrated. “Before I met with Carolin I wasn’t sure that I was taking the right steps to grow my business. I asked her a ton of questions about growing an online business and she gave me so many tips that I was able to use right away. Carolin surpassed my expectations because she offered sound business advice unlike a lot of other coaches who talk around questions, don’t really address what I am asking, or give me wishy-washy advice. I came away with next steps to help me define my target audience and attract more customers. Now it’s time to make magic together! Your passion + my experience are the perfect ingredients for building your signature package! I have never come upon a coaching business that I wasn't able to help scale massively by implementing my system. Now it’s your turn to go from 0 to profit by enrolling in Bring Your Passion to Life! I have stepped out of my normal launch schedule to create something especially for you. My standard coaching rates are between $5,000-$15,000, but I see so many women in my community who need additional support and I couldn't leave them hanging. This is the most affordable way to work with me because this program will pay you back many times more than what you invest. My calendar is booked with a live event, program launches, and speaking engagements all the way until fall 2017. I’m not sure when or if I can launch this program again. If you don't act now, you might miss out on a chance for us to work together this year. You’re tired of trying and failing - no more antics or spaghetti marketing, it's time to put up and go all in! You’re committed to yourself and you want to get the support you need to scale your business and make $5k-$10k more a month. Is that you, dear? Well ﻿then﻿ ﻿﻿step﻿﻿ up! I have a special technique and I'm not sure that my methods can be packaged into a signature package, how can you help me? I don’t have any clients yet. Is this a good investment and can you help me get consistent clients and grow my business? I’m not a Business Coach. Can I still package my offerings and make money? When it comes to marketing my program will I have to spend a lot on advertising, systems, or tools? I am really busy and work a day job on top of my coaching business. How much time do I need to commit to this program each week? I’m not making any money yet. I’m not sure if it’s a good idea invest. I’ve got questions, how can I contact you?